Hurricane Sandy wreaked massive destruction on the U.S. east coast. What is particularly noteworthy is the fact that this super-storm traversed a section of ocean that is typically too cold to form hurricanes. In addition to 90 mph (144 kph) winds and massive amounts of rain there was up to 3 feet of snow in West Virginia and other mountainous areas. Even before Hurricane Sandy made landfall in the U.S., it had already killed 69 people in the Caribbean. In the U.S., at least 75 people are known to have been killed by the storm so far. 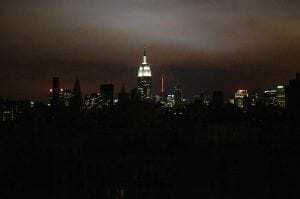 The mega-storm caused power failures in 17 states, depriving 8.2 million people of electricity. The storm also destroyed property and disrupted business. Before Sandy hit, federal disaster declarations indicate that winter storm losses have doubled since the 1980s. In 2011, thunderstorms caused over $25 billion in damages in the U.S., more than double the previous record. As reported by Bloomberg, the total economic loss from the Hurricane could exceed $20 billion, including insured losses of about $7 billion to $8 billion. These costs could subtract 0.1 to 0.2 percentage points from US gross domestic product in the fourth quarter. The industry forecasting firm IHS Global Insight estimates the costs of Sandy could be as high as $50 billion in damages and lost business. The hurricane killed 10 people in New York City and left parts of the nation’s largest city under water and up to one million people in the dark. The New York Stock Exchange was closed for the first time since the September 11th terrorist attacks and this was the first time it’s been closed for two consecutive days due to weather since 1888. Rising flood waters set cars adrift and toppled dumpsters. The storm shut down air travel, buses, trains and subways. The 108-year-old subway system “has never faced a disaster as devastating as what we experienced last night,” Chairman Joseph Lhota said in a statement. It was “a devastating storm, maybe the worst that we have ever experienced,” said Mayor Michael Bloomberg, who was unable to say when the city’s basic services would be restored. In addition to destroying buildings, the hurricane flooded tunnels and the city’s subway system. More than 80 flooded homes in Queens caught fire and were destroyed in an enormous blaze. Hospitals were forced to remove patients on stretchers including babies from neonatal intensive care. Sandy also caused a crane to break and it now hangs precariously over a Manhattan neighborhood. On Staten Island, a tanker ship ended up being beached on the shore. “This will be one for the record books,” said John Miksad, senior vice president for electric operations at New York’s Consolidated Edison. It is difficult to refute the observation that climate change is increasing extreme events in severity and intensity. A 2012 special report on extreme weather from the Intergovernmental Panel on Climate Change (IPCC) concluded that coastal flooding and more extreme precipitation were strongly linked to human-induced climate change and are expected to get worse in the future. It is a well documented scientific fact that carbon and other GHGs fuel extreme weather. The super-storm was made worse by higher sea levels and warmer oceans. Hotter land temperatures may also allow hurricanes like Sandy to expand their traditional seasonal and geographic boundaries. Although a single weather event cannot be taken as proof of global warming, when pooled together, the growing number of record setting data points provides a convincing picture. According to NOAA, the weather in 2011 was a “year for the record books.” In 2011, there were 14 record climate and weather-related events, each causing at least $1 billion in damage. Hurricane Irene alone caused more than $7 billion in damages. In 2012, Hurricane Sandy caps off another record breaking year. This year, the U.S. experienced the hottest January to June ever recorded and the largest drought in more than 50 years. There has also been record rainfall and flooding across much of America in 2012. There is clear scientific evidence that global warming fuels deadlier storms and more flooding. We also know that global warming leads to rising sea levels, which boosts storm surges, and increases the severity of flooding. Melting ice and water expansion is directly linked to climate change causing global sea levels to rise. Sea levels stretching from Boston to Norfolk, Va. are rising four times as fast as the global average. The sea surface temperatures off the coast of the U.S. northeast are about five degrees [3C] above average and second-highest global ocean temperatures on record were documented in September. The National Survey of American Public Opinion on Climate Change, conducted in December 2011, shows that more Americans are accepting the facts about climate change and personal observation of weather events seem to be playing an instrumental role. According to the survey, 62 percent of Americans agreed that there is “solid evidence that the average temperature on Earth has been getting warmer over the past four decades.” This number represents a 7 percent increase from the spring of 2011 and 10 percent higher than in the spring of 2010. Another survey by the Yale Project on Climate Change and the George Mason University Center for Climate Change reported that 70 percent of Americans believe that global warming is real. The massive storm hit just one week before Election Day. It is a tragic irony that President Barack Obama and Republican nominee Mitt Romney have largely avoided the topic of climate change. In addition to Hurricane Sandy, the wildfires and droughts we saw this summer should give voters pause for thought. Hurricane Irene and other extreme weather events in 2011 illustrate a trend of worsening weather conditions conveying the urgent need for consorted efforts to combat climate change. President Obama declared a major disaster in New York and Long Island, making federal funding available to residents of the area. Obama also cancelled campaign events to focus on coordinating the response to the mega-storm. For his part, Mitt Romney continued his irresponsible campaign of climate denial despite warnings from scientists which indicate that continuing to burn fossil fuel will guarantee climate chaos. Romney has said he remains unconvinced about the veracity of anthropogenic climate change and if elected, he has vowed to increase America’s commitment to fossil fuels. Romney is on record mocking rising ocean levels. He has even argued that FEMA’s budget should be slashed, or worse still, he has suggested that emergency management services should be taken away from the federal government and given over to private companies. The GOP’s commitment to climate denial did not waver even though Hurricane Isaac forced the cancellation of the first day of the Republican National Convention in Tampa. At least one poll suggests the American public does not agree with the GOP’s position. According to a Yale-George Mason survey, Americans think global warming should be a priority of the President and Congress. Although Romney is unlikely to change his stance on climate change, Sandy may encourage Americans to express a diverging view on Election Day. Rather than simply react to its effects, we need to engage the causes of climate change. As Bill McKibben explains, the fossil fuel industry is driving the climate crisis and spending millions to derail solutions. In October, Chevron made the single biggest corporate political donation since the Citizens United verdict. Thus far, the fossil fuel industry has spent more than $150 million to influence this year’s election. We need to heed the dire warnings offered by Katrina, Irene and now Sandy. We need to expedite the transition away from fossil fuels, increase support for renewable energy and overturn Citizens United. However, there will be no hope of achieving any of these goals if Republicans take the White House. Those who want to know what weather will look like if we do nothing to manage climate change need look no further than Hurricane Sandy. This super-storm was the consequence of a one degree rise in temperature, think of the devastation that will be wrought if we continue on our current trajectory and realize the predicted temperature increases of four or five degrees.